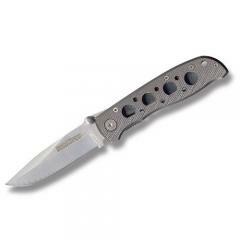 Compact, tough and built to military standards of performance, the Extreme Ops Cuttin' Horse Plain Folding Knife from Smith & Wesson is one of the most dependable knives on the market. Featuring a ruggedized aluminum handle with a sleek silver finish, the Cuttin' Horse is as impressive to look at as it is functional. Its 440C stainless steel forged blade is machine-honed to hair splitting sharpness and holds an edge longer than the competition. Dual thumb studs offer effortless and ambidextrous deployment, while a pocket clip and lanyard hole ensure the knife is never far from reach.